This fabulous cake has a bit of Scottish, a bit of cute, a bit of color, a bit of class, and a lot of love! And the cake topper is absolutely adorable! I love the Heroes teddy bear. 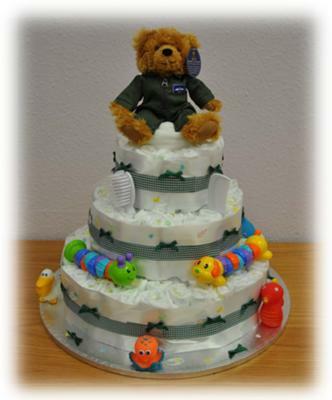 Audrey submitted her cute cake all the way from Scotland and is another reminder that there are thoughtful people from around the world who are 'Paying it Forward' with their inspiring nappy cake ideas & pictures. We love it! Audrey, thanks for your pretty nappy cake! Your great niece is a lucky little lady! 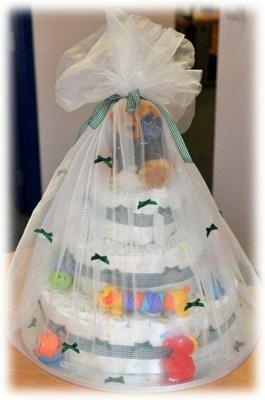 Add your cake to our diaper cake gallery, right here! 90 x 8lb - 13lb nappies. All these items were visible on the outside of the cake. Inside the Bottom layer there was, baby wipes, soap, cream, powder, 2 moses basket sheets on top to cover it. Inside top layer there was mix of vests, babygros, mits, bootees, socks, all taken out of wrappers and rolled tight. On top under the teddy is a fleece hooded blanked which i rolled and sat the teddy on, you can just see it popping up. Then topped with a Save our Heroes Teddy being sold by our local RAF station to raise funds. The first and second layer i rolled each nappy and put an elastic band round each one, then put 3 together and bound them together with elastic band. then i laid the gifts in as small a circle as i could and put the nappies round them, and joined the elastic bands like a daisy circle and put it round the lot to pull it in, then i arranged the gifts as tightly as possible. Second layer, same thing 3 nappies bound..and gifts in middle and bound tightly. 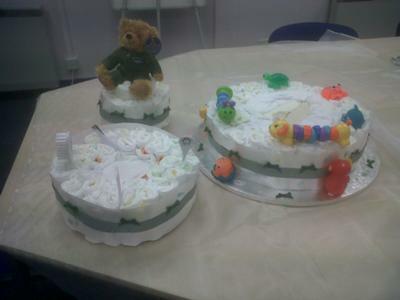 Third layer is one rolled nappy round the edge with a rolled up fleece blanket inside and the teddy on top. I than put 3" white/ivory ribbon round to hide the elastic bands, joining with double sided tape. Then i put the hunter green ribbon on top centering and joining again with double sided tape. I then stuck the confetti randomly with pritt glue, and added some small green ribbons to bring out the green in it. I then put the layers on top of each other, the weight held them down, and put it on the cake board, you could start building it on the board if you want. Then i added colourful toys, on outside, and comb brush clippers and spoon, just whatever to brighten it up. Then i wrapped it in white shimmery voile and tied with matching ribbon on top and stuck some green bows on with double sided tape. Finished !! I built the basic part in one evening then added to the outside as i had ideas how to give it more colour. The ribbon, bows and confetti i got on Ebay. This is a big cake, but you could just do from as little as one layer, and maybe put a voucher in the middle for a gift. Depends on how much you want to spend. This cake had a lot in it, but it was for my first great niece so i went a bit mad !! !